Think India is a national forum of students, alumni and faculty of premier institutes of national importance like the IITs, IISc, IIMs, the NLUs and other institutes across India spanning several academic disciplines. Think India is an initiative to bring the best talent from the finest institutions with the broader objective of generating ideas and views geared towards national rejuvenation and also to inspire young minds to take upon themselves their responsibility in the process of nation building. 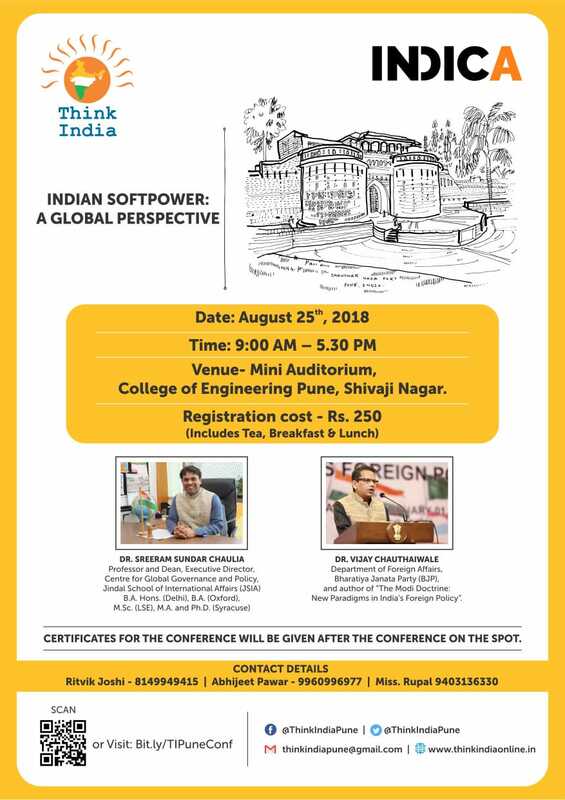 Think India Pune Chapter is hosting a conference on Indian Soft Power : A Global Perspective. DR. SREERAM SUNDAR CHAULIA, Professor and Dean, Jindal School of International Affairs and DR. VIJAY CHAUTHAIWALE, Alumni London Business School and Indian Institute of Management Bangalore will grace our event. In addition to this various Academicians, Professors and Foreign Policy Experts will also grace our event and provide intellectual stimuli to our participants. Students can register for the conference by filling the registration form at this link. For programme schedule, click here.